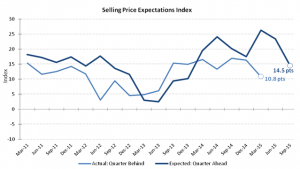 Near-term price expectations have dropped sharply, with persistent moderate activity in the economy leading more businesses to reconsider the level at which they sell their goods and services. 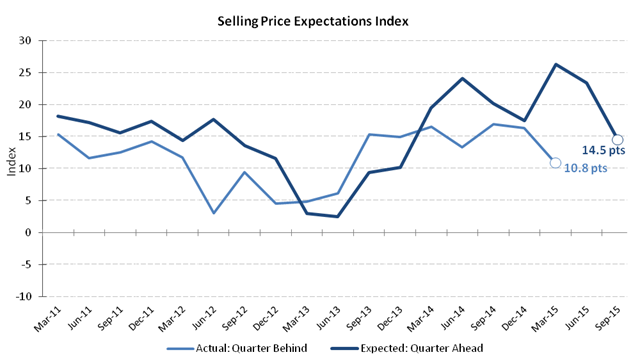 Reflecting soft official inflation data, Dun & Bradstreet’s latest Business Expectations Survey reveals that the Selling Price Expectations Index for the third quarter has dropped to 14.5 points, down from 24 points last quarter and to its lowest level since 2013. The correction comes as fewer businesses indicate that they will increase their prices in the next three months. Twenty-four per cent of businesses plan to raise their prices in Q3 2015, down from 31 per cent in the previous quarter. At the same time, more businesses plan to cut their selling prices, up from 8 per cent to 10 per cent. Similarly, the Actual Selling Price Index has fallen to 10.9 points, with fewer businesses reporting they had lifted their prices in the three months to March. According to the survey, 24 per cent of businesses raised their prices during the first quarter of the year, compared to 26 per cent in the previous quarter, while 13 per cent reported having lowered their prices, up from 10 per cent.